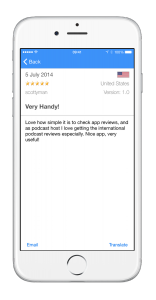 Awareness of reviews is critical to maintaining and improving any app or podcast, and being able to translate a review at the touch of a button makes life so much more easy. It allows us to better serve our users, improve our brands, but also improve the Apple eco-system as a whole. No more trawling through countries in iTunes Connect looking for new reviews that may or may not be there, AppReview360 delivers reviews to your iPhone when they appear. Easy. AppReview360 gets every review from each iTunes international store and notifies you as new reviews are posted on your chosen app, podcast or iBooks. Reviews will appear on your iPhone automatically. AppReview360 does the work for you, monitoring all Apple App Stores in the background and will alert you as new reviews are found. You can keep on top of your reviews without having to spend the time searching. AppReview360 gives you a quick look and also a detailed view of reviews and ratings. See when and where it was posted and who wrote it. Want to send a review to email to investigate later? AppReview360 makes this easy. Review in a foreign language? Tap on translate! Want to quickly find any 1 star reviews? Just tap on the filters! Filter by version, or by country too! App Store ratings are different on every store. Just because you may have a 5 star rating in one country, you may have a 1 star in another. AppReview360 shows individual overall country ratings at the tap of a button. How much does AppReview360 cost? AppReview360 is free to download from the App Store and includes 7 days full access. We provide extremely competitive subscriptions on either a 1, 3 or 12 month basis, with significant discounts for the longer periods. Download AppReview360 today and try it free for 7 days. We are sure you will see the great benefit. If you have any comments for features, please reach out to us and let us know.